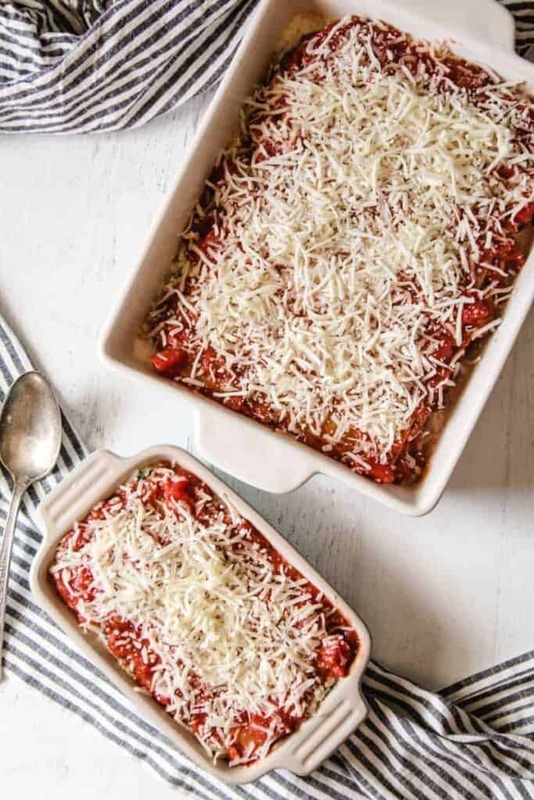 This family favorite Gluten-free Lasagna recipe is perfect for a large gathering or lazy day dinner. 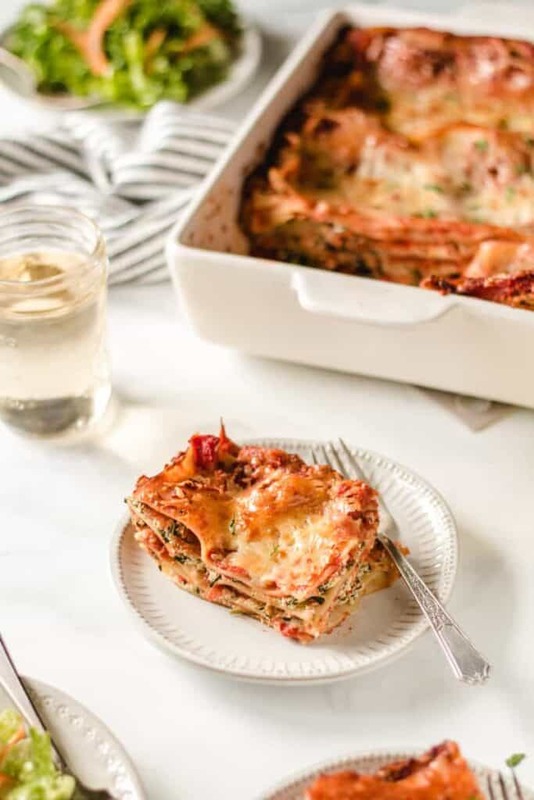 A quick and easy homemade sauce and spinach-ricotta cheese mixture are layered with no-boil noodles and mozzarella cheese to make the perfect lasagna. I have yet to meet a person who doesn’t love my lasagna! I mean, who does’t love pasta? When I need to feed a lot of people, I often make a large pan of gluten-free lasagna and a giant salad and call it a day. Lasagna is one of those ‘labor of love’ types of meals. There is a bit of a process to making lasagna, it’s not hard but it’s definitely not a 30 minute meal! That’s why it’s the type of recipe you make on a lazy Sunday or in advance for a special gathering. 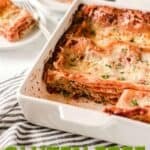 This gluten-free lasagna recipe is universal and can be made with gluten-free or regular noodles. If you want to save costs, you can make a small pan of gluten-free lasagna first, and then make the rest with regular noodles using the remaining ingredients. There are a couple components that need to come together before you can get to layering your lasagna. First you need to make the homemade marinara sauce. Sure you could use jarred sauce, but you want to be extra, don’t you? It’s a simple sauce that starts with a base of flavor in the form of onion and garlic. Then the dried spices and tomato paste are mixed in. After that dump in the canned tomatoes. See that wasn’t so hard was it? Just let it simmer for a bit to enhance the flavors. The marinara sauce is done, kids! 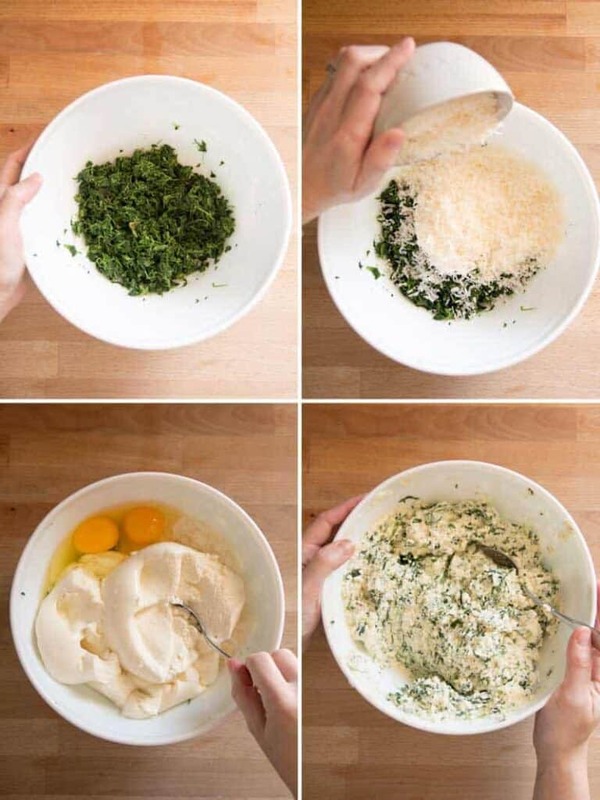 …eggs and ricotta cheese. Mix it all together with a bit of salt and pepper. The last thing to do is gather the noodles and mozzarella cheese. I have been using Barilla No-boil Gluten-free Lasagna (affiliate link) and they are great! I can’t even tell that they’re gluten free and they are sturdy in the lasagna. Not to mention, using no-boil noodles saves a ton of time and hassle. No boiling water and no cooling noodles = less fuss and less mess! Grease your pan and put all of the ingredients by it: the sauce, the cheese mixture, mozzarella cheese, and the noodles. Spread it out over the cheese (shown in top left image below). (Shown in top right image below) This completes one layer! Repeat steps 4-7 two more times: Ricotta, Mozzarella, Marinara Sauce, Noodles. 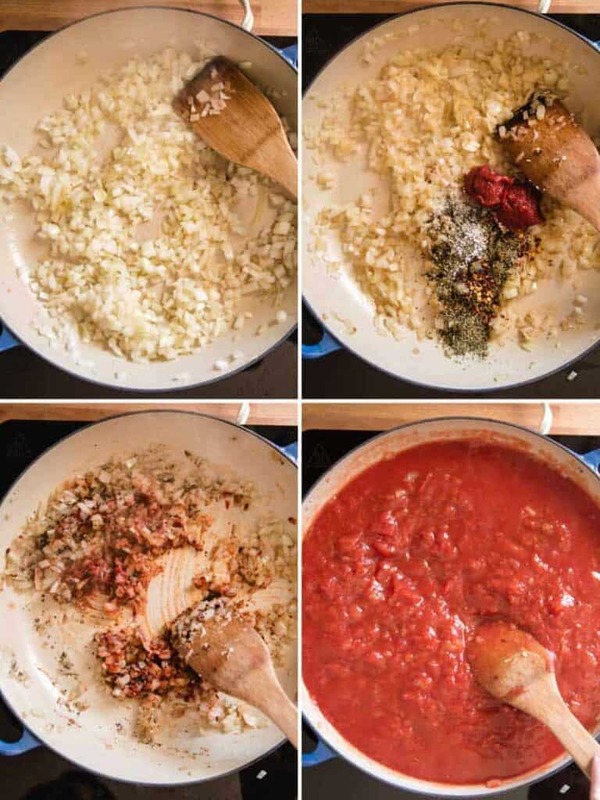 On the last layer of noodles, spread a layer of marinara sauce and sprinkle with mozzarella cheese (shown in bottom right & left images above). 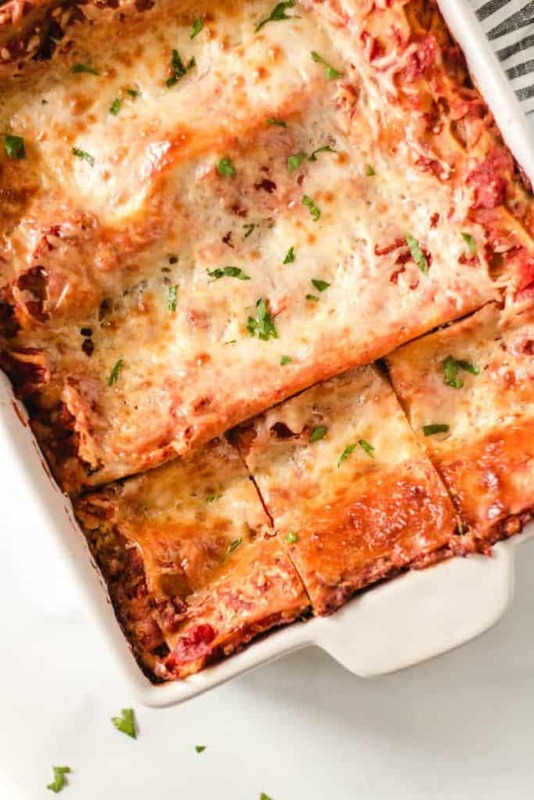 This recipe makes enough lasagna for about 2 – 9×13 pans of lasagna. I made one 10.5 x 8.5 pan and two smaller pans to freeze for later, an 8×8 and a 5×7. You can use whatever pan sizes and combinations you like! I just keep layering and making pans of lasagna until I run out! 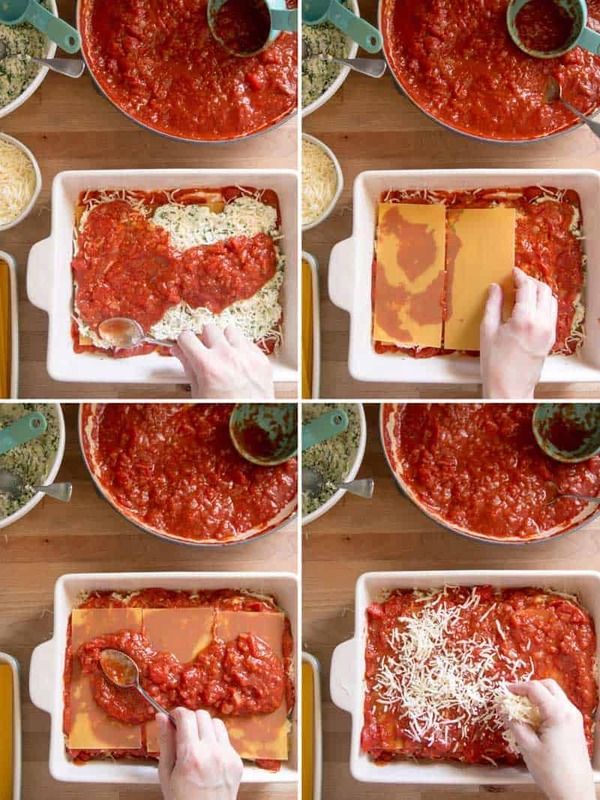 The 5×7 size pan perfectly fit one lasagna sheet per layer. This would be a great size for 1-2 people. A resounding… YES! 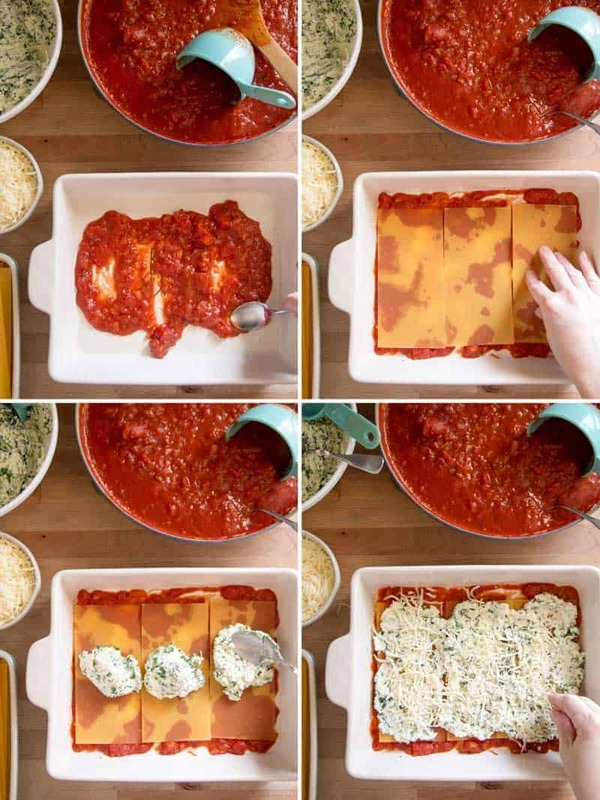 Layer the lasagna in a freezer safe dish and wrap tightly. Freeze uncooked. Thaw completely in the refrigerator and bake according to the recipe. It will take at least overnight to thaw in the fridge… so plan ahead! 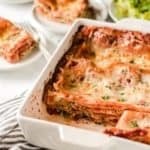 Can I cook lasagna in the Instant Pot? 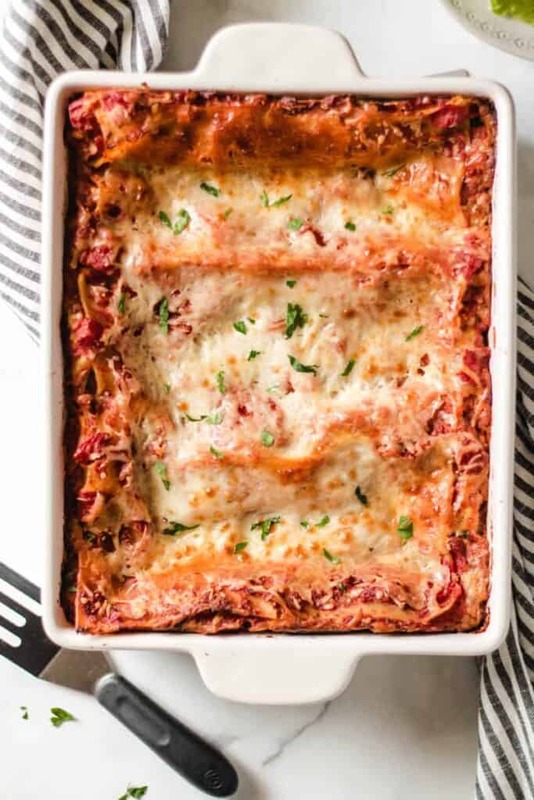 If you layer the lasagna in an oven-safe dish that also fits in your instant pot (affiliate link), you can cook it in there… even if it’s still frozen! I tried this with great results! Cook for 22 minutes on High Pressure and then pop it under the broiler to brown the cheese. It was phenomenal! Yes! You can make this lasagna 1-2 days in advance. Keep refrigerated until time to bake. Allow to come to room temp for about an hour before putting it in the oven. It may take a little longer to bake when baking from refrigerated. Check the temp in the middle of the lasagna. When it is about 165° in the center and bubbly, it is done. In a large pan heat the olive oil over medium heat. Sauté the onions and garlic until tender, about 3-4 minutes. Add in the Italian seasoning (4 tsp), red pepper flakes (3/4 tsp), Kosher salt (2 tsp), and black pepper (1 tsp). Stir in the tomato paste (3 Tbsp). Pour in the canned tomatoes. Simmer for 30 minutes on low. Thaw the frozen spinach according to package directions. Place in strainer to cool and drain. Once cool enough to handle, use your hands to squeeze out as much water as possible from the spinach. Place the spinach in a bowl and chop roughly with kitchen shears. Add in the Ricotta cheese, Parmesan cheese, eggs, and a pinch of kosher salt and black pepper. Mix well to combine. Preheat oven to 350°F. Grease a 9×13 casserole dish. Gather all of the ingredients near the dish to make a layering station. Spread a thin layer of marinara sauce in the bottom of the pan. Place a layer of noodles on top of the sauce. Don’t worry if they don’t fill the entire pan exactly. Four sheets should fit in the bottom of a 9×13 pan. Place a dollop of ricotta cheese mixture (~1/4 C) on each noodle and spread it out. Then sprinkle with mozzarella cheese (~1/3 C). Spread about 1 cup of marinara sauce on top of the cheeses. Place another layer of noodles on top of the sauce. Repeat this step 2 more times. On top of the last layer of noodles, spread another cup of sauce. Sprinkle with mozzarella cheese. Cover the lasagna with foil. Bake at 350° for 60-80 minutes. Remove the foil for the last 15-20 minutes to brown the cheese. 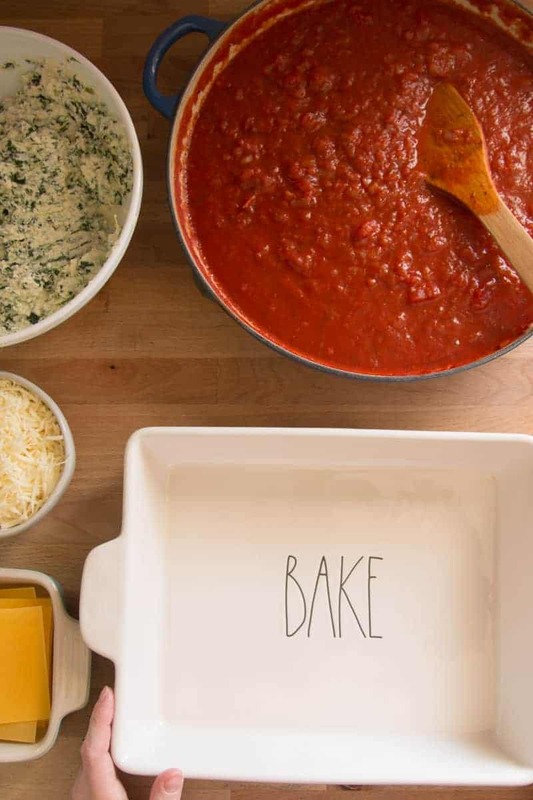 Depending on the size pan you use or if the lasagna was cold (refrigerated), it may take less/more time to cook. Keep an eye on it. It’s done when the sauce is bubbly around the edges, the cheese is melted on top and slightly brown, and the center is about 165°F. Freeze uncooked, wrapped tightly. Thaw completely (at least overnight) in the fridge before baking. From right to left: 1. the Barilla pasta sheets (I get mine at Wal-Mart) 2. the ‘bake’ dish shown above (similar, I found mine at TJ Maxx), 3. the 5×7 pan that perfectly fits one barilla sheet per layer (Found mine at Marshall’s), 4. the casserole dishes that will fit in the Instant Pot.